For the first time in a long time, the Sabres were working to add players at the NHL Trade Deadline. Jason Botterill brought Brandon Montour to Buffalo in an effort to upgrade his blueline. He also shipped Nathan Beaulieu to Winnipeg in order to clear space for his newest acquisition. After Jason Botterill’s comments on Wednesday it seemed fair to assume he’d have a relatively quiet trade deadline. The holes in his team’s roster were showing and the playoffs were looking bleak as other Eastern Conference contenders added help while Botterill stayed patient. It was hard to stomach for some, watching the Sabres slide from the literal league lead to a six-point deficit from the final wild card spot. For others it was just fine. Botterill was going to build through the draft and stockpile prospects. That got turned on its ear on Sunday when Botterill sent a first round pick and Brendan Guhle to Anaheim for Brandon Montour. Just What Does Botterill Have to Offer in a Trade? For the first time in a while the Sabres are in a position to buy ahead of the trade deadline. Or, at the very least, use their picks and prospects to add rather than selling bodies to build assets. Their post-November slide is complicating matters, as they’re doing impressive work to fall out of playoff contention. That slide will likely temper Jason Botterill’s urge to get too aggressive prior to the deadline as a struggling team with picks to spare isn’t won’t get much charity from around the league. Of course, they probably weren’t getting too many cheap offers at the peak of their winning streak either. We aren’t privy to any conversations Botteril is having during the season, so we’ll never know how active he is during the year. But Botterill hasn’t taken much of a shine to in-season trades in his short term as general manager. And it’s the general manager’s job to assess the market as it fluctuates to determine when to pull the trigger. He’s made five in-season (counting the Deslauriers deal made on the eve of last year’s opener) trades and only one was of any real significance. That being the deal that sent Evander Kane to San Jose and it was no secret that deal was coming. Botterill’s done most of his work in the offseason, when prices are typically lower and more players are usually available. 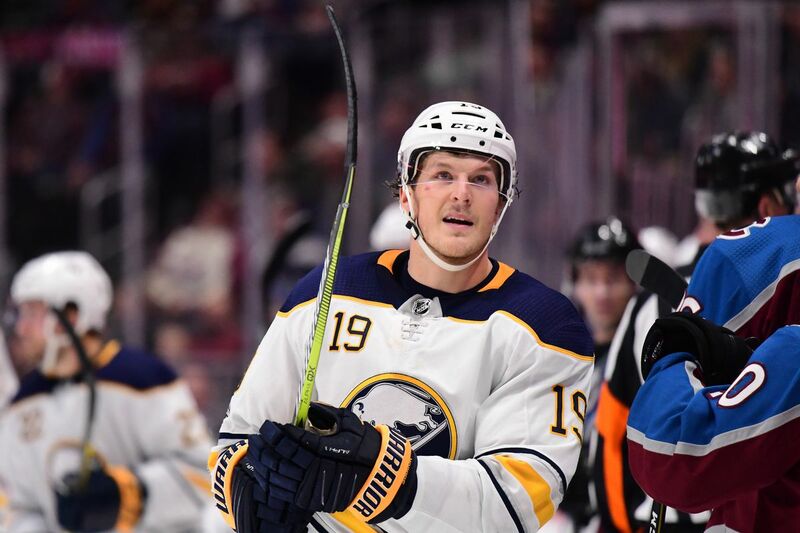 Even with the Sabres finally back in the conversation, he may still opt to make his big moves in the offseason for those two reasons. That will frustrate a lot of fans as you’d hope Botterill is at least working to keep his team competitive down the stretch. The other obstacle facing Botterill is what exactly he will be able to offer that other clubs will value when it comes time. Buffalo’s pipeline isn’t packed with talent – one reason that Botterill is likely reticent to deal his firsts. Nor are the players they have in the pipeline obvious talents another team would covet. There is talent to be offered, just not the overabundance you’d want when it comes to a continued retooling. Two in the Mailbox – What to do with Mittelstadt? Two in the Mailbox, the weekly (week and a half this time) mailbag on the Sabres, goalie stuff, Buffalo and anything in between, is back. You can submit to the mailbag using #2ITBmailbag on Twitter or emailing 2intheboxbuffalo@gmail.com. Two in the Box by Chris Ostrander is licensed under a Creative Commons Attribution 3.0 Unported License. If you are the owner of an image or link that appears on this site and you wish for it to be removed, feel free to email me at 2intheboxbuffalo@gmail.com. I will be sure to remove the work as soon as possible.